You are currently browsing the tag archive for the ‘Mein Kampf’ tag. This Disney short is an original take on the classic fable. It has a clear war message, even though there’s no direct visible link to World War II. The villain, Foxy Loxy, uses a psychology book, from which he quotes, to lure the inhabitants of a poultry farm into his cave. The inhabitants of the poultry farm are clear representations of contemporary American society, including the upper class (turkeys), female middle class (chicken), male working class (ducks) and the youth (chickens and roosters, whom we see dancing to hot jazz in a short scene). Foxy Loxy chooses a simpleton called Chicken Little as his main object, making him believe the sky is falling and encouraging him to spread the rumor. Originally, Foxy Loxy was to read from Adolf Hitler’s book ‘Mein Kampf’. It is not likely that the quotes are really from ‘Mein Kampf’, but they do contain surprisingly true lessons in how to manipulate the masses and how to undermine the present authority. The film’s clear war message is not to fall for rumors and not to join mass hysteria. The film’s ending is as grim as there ever was one in a classic cartoon. In fact, the vision of a graveyard full of chicken bones is only topped by the similar ending in ‘Education for Death’ from the same year. 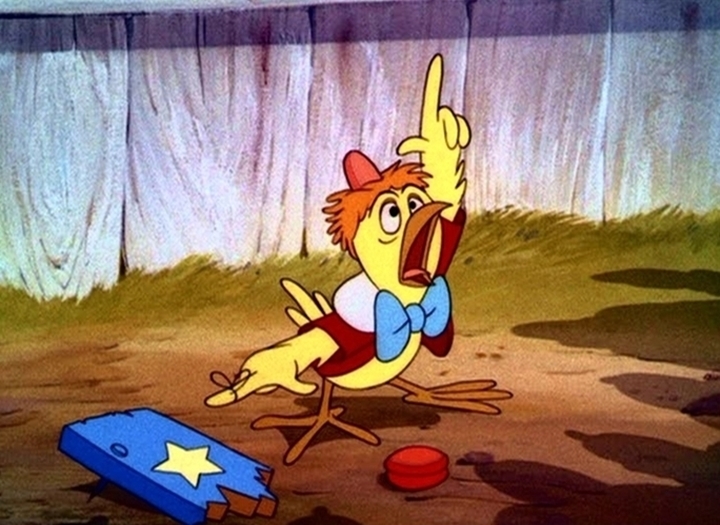 ‘Chicken Little’ remains a little known Disney film, but its message is surprisingly fresh, and is probably even more valid today in an era in which propaganda and false rumors roam the internet and social media than it was during World War II. ‘Chicken Little’ was to be the last short directed by Clyde Geronimi before his dull comeback in ‘The big wash’ (1948). The Disney studio revisited the fable in 2005 in the feature film ‘Chicken Little’, which has ca. nothing in common with this far more interesting and disturbing short.